Club Penguin Cheats by Mimo777 Club Penguin Cheats by Mimo777: Club Penguin Parents Survey! 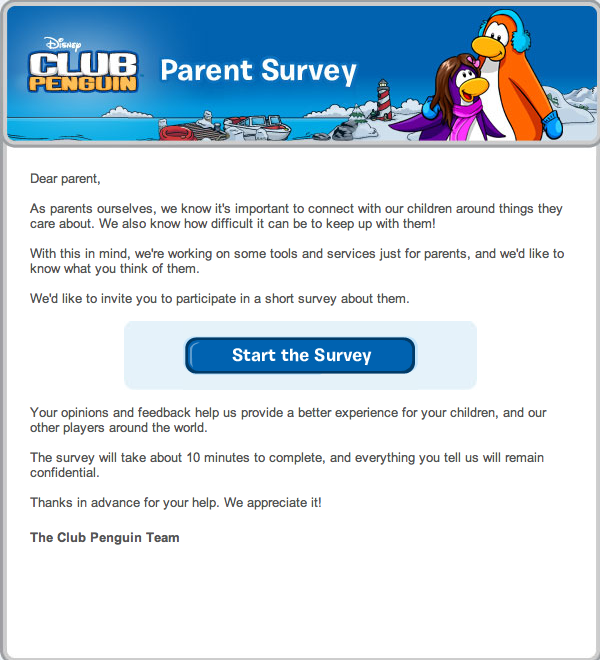 This survey just asks your parents their gender, age, how many children have memberships in your home and how long they have played Club Penguin. Seems kinda weird. I wonder how this could possibly help them? I wonder if this is part of the "Parents Do Beta Test" I told you about? Did you get this survey yet? How do you think it will Club Penguin? There are 2 new postcards! There is a let's explore postcard and a check out my stamps postcard! Thanks! For the Stampede Party can you come to my iggy? PLZ! It would mean a lot! Huh? I didn't get it for my penguin! I think the reason why they want to ask about memberships is to see how successful their advertising is for memberships.